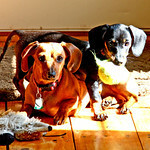 Doxie Archives on Hillbilly Hill Farm: Spring was beautiful again this year! Spring was beautiful again this year! I was so glad to see signs of spring showing itself this year! I was ready for some color to be added, and it came out with a vengeance...green grass, the trees starting to come alive, and flowers bursting out all over! Such a beautiful time of year!! I was out walking in one of our pastures, admiring the beautiful redbud trees and even saw a few of these pretty little violets. One of my favorite flowers of early spring...least on the ground...I always love the redbud trees which we have a ton of here on our little farm! Then there were my iris. They sure seemed to be early this year...may not have been, cause I know they are an earlier variety...just seemed really early. But they were sure pretty, and I thought of our Sister-in-law who died a year ago now, as she loved them so. It's hard to believe it's been over a year since she died. Course, it's hard to believe it's been 4 months since Clara died...time does fly.